After spending 5 nights in Banda exploring the Spice Islands and diving we took off for a 375 nm sail to Hoga Island, a small island in the Wakatobi National Park in South Sulawesi, Indonesia. Wakatobi is a portmanteau (a new word for me!) of the four main islands in the group: Wangi-wangi, Kaledupa, Tomia, and Binongko. Hoga is closest to Wangi-wangi, and while we didn’t stop at Wangi-wangi, several friend boats did. Wakatobi is not technically a rally stop, although it is in the booklet. It’s called a “stopover” in the booklet and I’m not sure how that’s any different from an “on your own time” stop. Wanci is the main town in Wangi-wangi. It has a protected lagoon for visiting boats to come into, and therefore is a popular stop in Wakatobi. While the rally boats were passing through, the WIC (Wakatobi Information Center) was very active on the radio. They must have AIS and hailed boats coming into the park to offer their services, including a pilot boat to guide you into the lagoon. Read about Escape Velocity’s stop in Wanci. There are two places to anchor at Hoga. The first is the lagoon, where you can drop anchor in 15 meters of sand, but it’s unprotected from the prevailing winds and has quite a lot of chop. The second anchorage is where we went: the dropoff. We nosed Starry Horizons right up to the reef, which is covered in five feet of water. When our depth sounder read 90 feet, we dropped anchor onto the sand and floated back. The prevailing winds kept us off the reef, but if the winds switched around we would have been in major trouble. An official boat came by selling marine park permits. We paid 430.000 Rp ($24 USD) for our boat and two people in order to have access to the park. There are two piers; the southern one is the one we used to tie up our dinghy. The northern one is newer, but also taller and in shallower water, making it kind of useless. 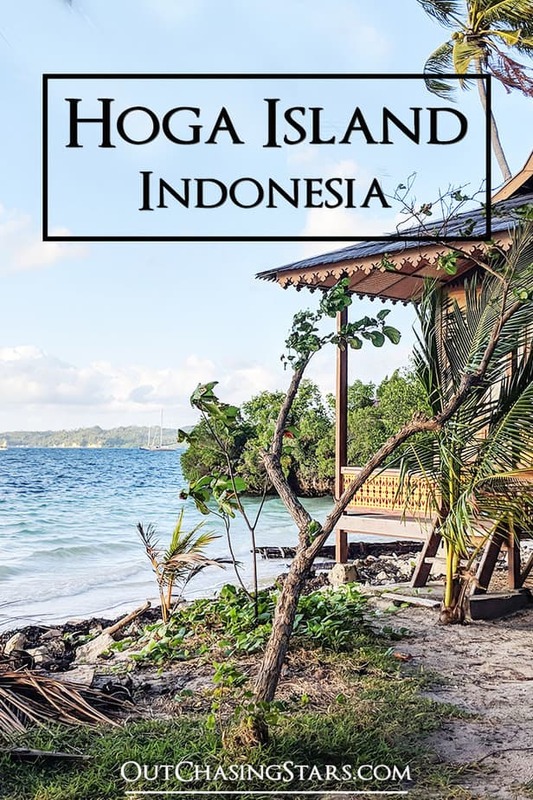 There are about a hundred bungalows on Hoga Island. Most seem to be in disrepair, but there were definitely guests in the resort when we were there. 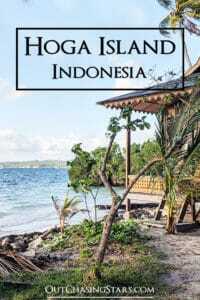 I think there are two resorts, but can only find information for one online, the big one called Hoga Island Dive Resort. Even out here….trash all over the beach. Pretty sweet view! Too bad the bungalow was derelict. Every day locals came by on their boats to try to sell us stuff. Sometimes it was produce like cucumbers or tomatoes, but more often it was the day’s catch. We were offered lobsters, fish, squid, octopus, and even mantis shrimp, something I’d never seen before. I bought two, and thankfully we had enough internet to tell us to cook them like shrimp or lobster. They aren’t much meat but they are delicious. A mantis shrimp in a bottle. Read more about the mantis shrimp. Visible from our anchorage, the island of Kaledupa has a stilts village called Sampela. We didn’t go, but our friends did. I assume that this is where the boats selling us provisions come from, since it is the closest village. Read Slow Flight’s story of visiting Sampela. 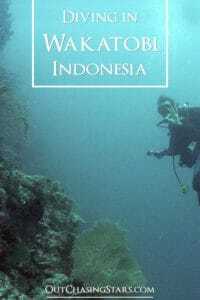 The big attraction for Wakatobi is its marine life since it is a National Park. There are several mooring balls around the drop off that boats can tie up to for a snorkel or dive. We did one dive trip with Carlos from S/V Mirniy Okean, and made several trips snorkeling just off Starry Horizons. We enjoyed the dive because of the two big highlights; a humphead wrasse and sea snakes! There is a Dive Center onshore, plus the dive resort. The dive resort filled our dive tanks for us for 50.000 Rp each ($3.50 USD). Despite the fact that Wakatobi is a national park, the marine life is not being protected. Liveaboard boats and cruisers have no moorings to attach to, so instead they are dropping anchor. The local fishermen have overfished the area, and are still catching (small) fish and selling them. Paired with the trash problem in Indonesia, the future for Wakatobi does not look good. The starfish is cool, sea snake – not so much. Make Banda Pancakes at Home!